A state grant will fund the Boone County overdose quick response team. 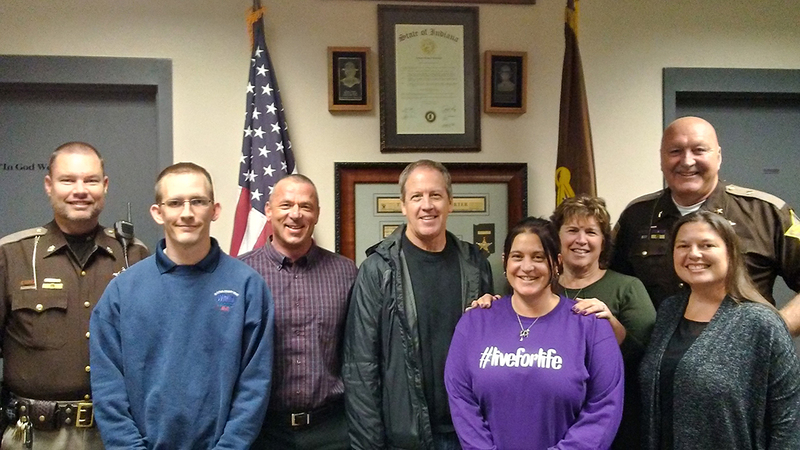 From left, Major Brian Stevenson of the Boone County Sheriff’s Office; Travis Stevens, Boone County Witham EMS; Johnny Wilson, Integrative Wellness recovery coach; Integrative Wellness CFO Doug McGuire; Lou Holland, Youth & Family Health Network recovery coach and community health worker; YFHN Executive Director Michelle Standeford; Lynette Clark, Integrative Wellness director; and Boone County Sheriff Mike Nielsen (back). Boone County’s Youth & Family Health Network received a grant for $50,000 to develop, train and coordinate an overdose quick-response team in Boone County. The grant was provided by the Indiana Division of Mental Health and Addiction of the Family and Social Services Administration. The grant is funded under the 2016 21st Century Cures Act. A quick-response team is a group of trained professionals who follow up within 24 to 72 hours with an individual who has overdosed and been treated with an overdose reversal. YFHN is partnering with Integrative Wellness, Boone County Witham EMS and the Boone County Sheriff’s Office to round out the team. The team also will provide Narcan kits for the family and training on how to use it. YFHN will start contacting those in need of assistance Dec. 1 and will receive notifications of overdoses through the Boone County dispatch at the Boone County Sheriff’s Office. The grant money will fund the team from Dec. 1 to April 30th.